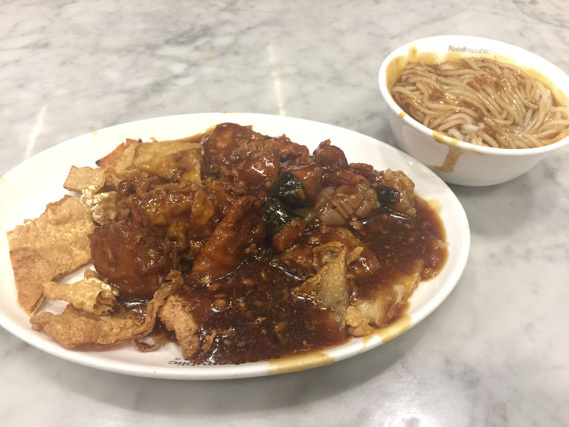 Most of us in Singapore are familiar with yong tau foo as a dish available at almost all hawker centres, coffeeshops and foodcourts in Singapore. The traditional Hakka Chinese versions of yong tau foo are made with tofu cubes stuffed with minced pork and herbs, then deep fried and served with bean gravy. 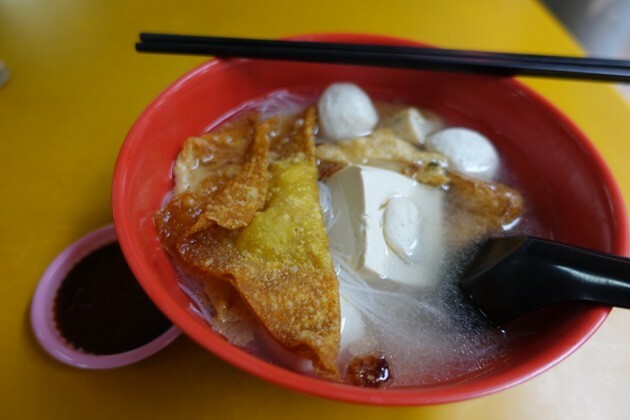 In Singapore though, Yong tau foo is a dish which can be ordered with soup or with a gravy, with the flavour of the dish contributed by the variety of food items picked by the customer. 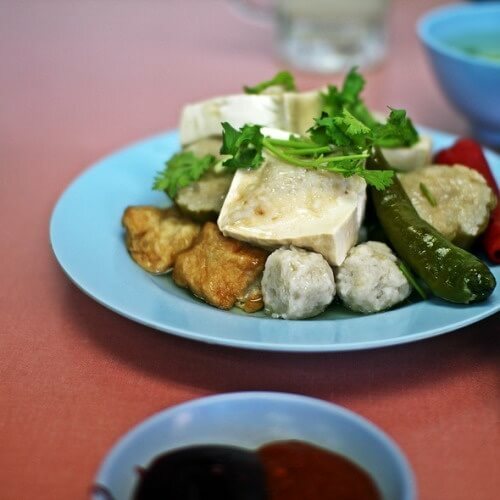 The food items are pretty much considered healthy, as they are simply made up of a variety of tofu, fish paste, meatball, egg and vegetables which are then boiled. The fried and stuffed ingredients of course, don’t fare as well in the healthy range. The dry versions come with a red fermented bean curd gravy drizzled over. As such, I encourage the eating of yong tau foo as a preferred choice for a meal (but go easy on the gravy). 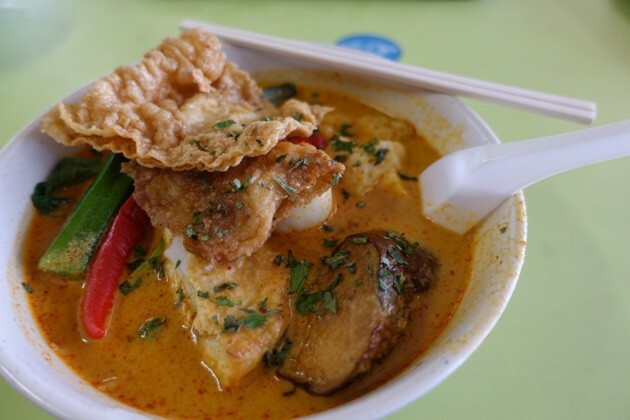 Along with creativity and innovation of ideas by our hawker chefs in Singapore, yong tau foo can be eaten in numerous ways be it soup, dry, with curry or laksa gravy, or even pairing it with another local delicacy, a la yong tau foo with chee cheong fun. 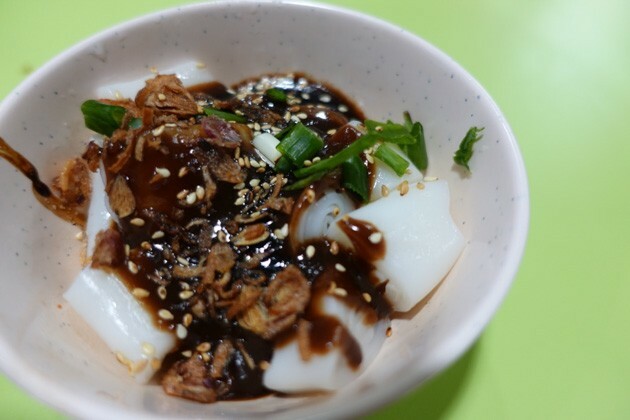 I hereby recommend the following best yong tau foo places in Singapore. One of the stalls at Amoy Street Food Centre, Amoy Street Hakka Yong Dou Fu’s (once known as Zhen Jie) target audience is mainly the office workers who are around at the Central Business District on weekdays. 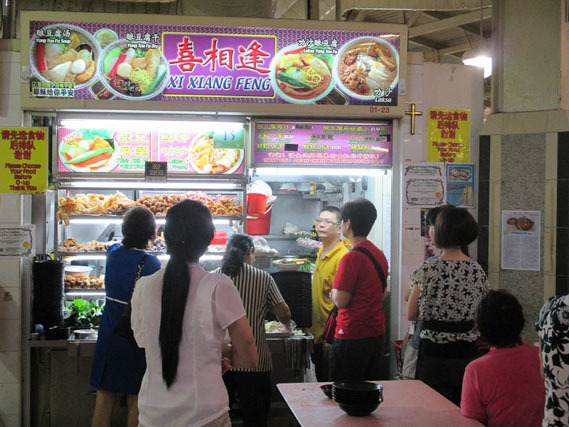 The stall always has a long queue that stretches across the length of four hawker stalls. The yong tau foo 5pcs + noodle ($3.60) is a very reasonable price for both the quality and amount of ingredients. Almost all of the yong tau foo ingredients are unique to the stall. Example of an ingredient with a special method of preparation is the wrapping of an entire piece of beancurd inside taupok skin, before frying it. Another point to note is the use of thick homemade fish paste with carrot strips as a filling for all of the yong tau foo ingredients at Amoy Street Hakka Yong Dou Fu. Another unique selling point of the hakka yong tau foo at this stall is Amoy Street’s yong tau foo 5pcs + chee cheong fun ($3.80). I had reached the stall really early, but managed to stay in time for the uncle to make a bowl of this signature dish of his for me. The texture of the chee cheong fun is silky and smooth with a delectable layer of grease that is not too oily. Paired with the sweet sauce and chilli made in-house, the entire dish is fragrant and is very genuine of the traditional chee cheong fun recipe. And I believe it pairs splendidly as a carbo filler with the yong tau foo ingredients at this stall. Stumbled upon Poy Kee Yong Tau Foo while looking out for two other more famous yong tau foo stalls at People’s Park Complex Food Centre. What had attracted me to the stall was the live preparation of the yong tau foo ingredients in front of customers, as well as the really reasonable pricing listed on the stall menu. The yong tau foo with noodles ($3.30/$4.30/$5.30) are a must-try. Just by ordering the smallest portion was sufficient to fill my tummy. What was most delectable about the yong tau foo here is the pairing of ikan bilis with the yong tau foo consomme. The ikan bilis were crispy and added a tinge of salty fragrance to the dish. A popular choice at People’s Park and overall, worth trying. 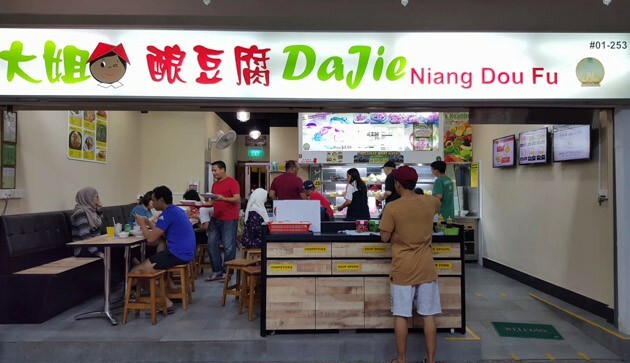 Established in 2007 with two branches situated at Clementi and Bukit Batok, Da Jie Niang Dou Fu offers a halal menu and gives customers the flexibility of six different styles of yong tau foo. They are namely the traditional Hakka style, Tom Yam, Laksa, Ampang or the simpler Black Bean and Tomato Ketchup. Seeing that they offer an innovative menu, I decided to go for something that deviates from the norm. Hence decided to try Da Jie’s laksa yong tau foo with thick bee hoon, instead of the traditional hakka yong tau foo. 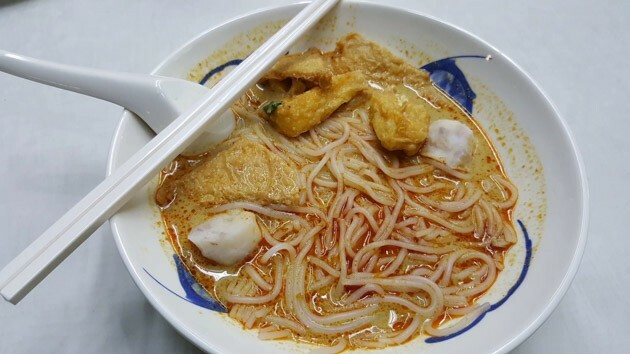 The laksa yong tau foo ($3.50 for min order of 5pcs + $0.60 for noodle) consists of laksa gravy that was light and savoury. It is not too thick and one won’t feel that guilty indulging in its splendid flavour maintained at the same time. The yong tau foo ingredients here are generous in filling and had a nice bounciness. 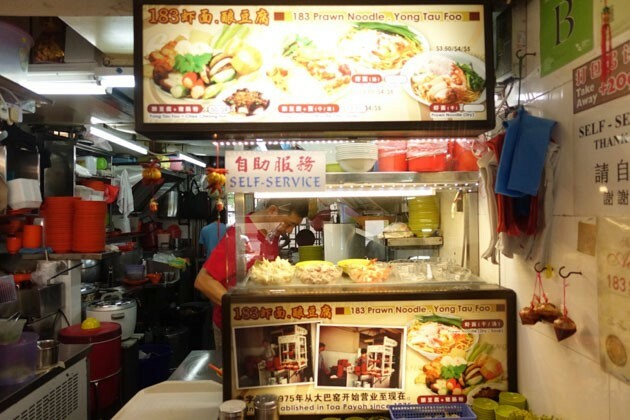 Situated within a coffeeshop at Toa Payoh Central that is bustling during the weekday lunchtime hours, 183 Prawn Noodle Yong Tau Foo has had a long history. 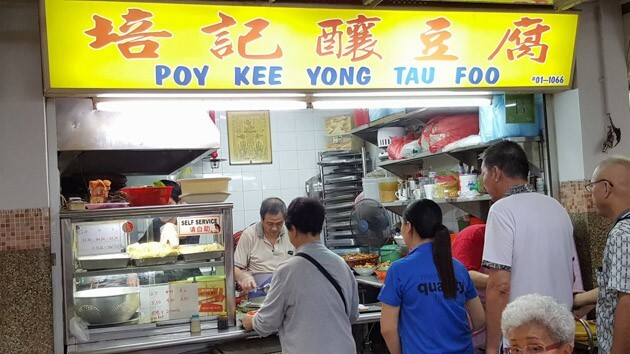 Besides Zhen Jie Hakka Yong Dou Fu, this is another stall that offers the special pairing of yong tau foo + chee cheong fun ($3.50/$4.50/$5.50). Flavourful along with a smooth texture of the chee cheong fun but I’d still go for Zhen Jie’s version. Nonetheless, the yong tau foo soup and ingredients were very tasty with the soup broth having a tinge of peppery flavour that gives it oomph. 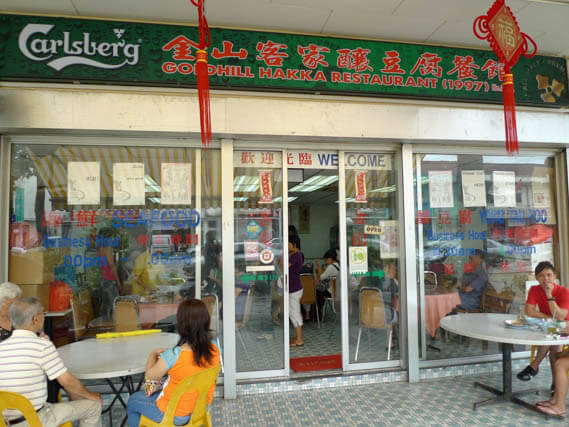 Goldhill Hakka Restaurant is a small restaurant with a long history of establishment. Steven Lee is the second generation owner who has been spearheading the store at the current premise, since 1971. 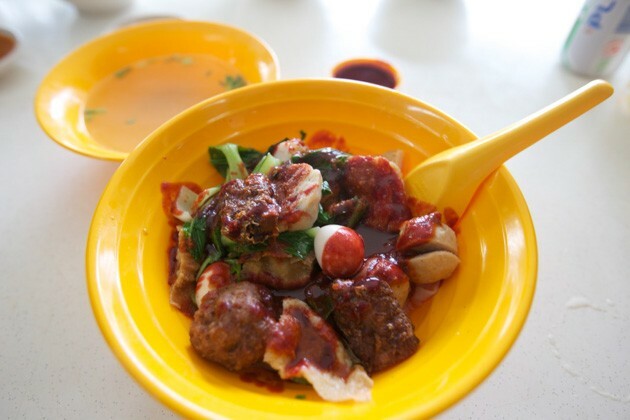 The signature dish on the menu is none other than the old-school yong tau foo ($5.00). The yong tau foo menu here is made up of only seven items, including tau pok, smooth toufu, fishball, stuffed chilis and meat ball. These are all traditional Hakka-style yong tau ingredients. The entire dish has an old-fashioned charm to it, which is difficult to find in yong tau foo stalls at common eateries in Singapore. 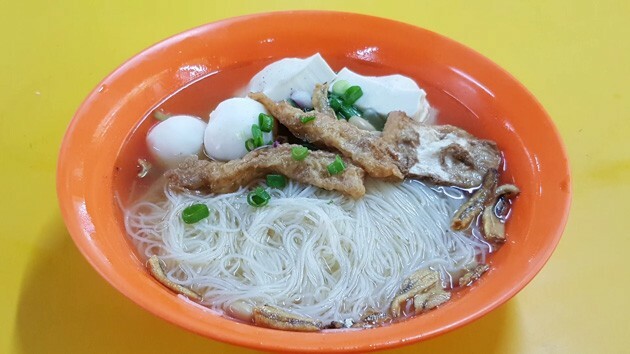 Ask anyone who grew up staying at Ang Mo Kio and they’re sure to know about this yong tau foo stall which concocts one of the best broths for young tau foo. 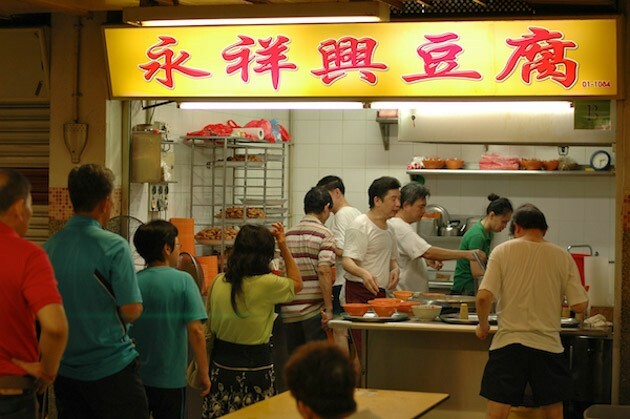 Be it peak or off-peak hours, Xi Xiang Feng Yong Tau Foo is always having a long queue. The standard yong tau foo ($0.30 onwards for each piece) has a variety of close to 40 items for customers’ selection. This is definitely a stall to visit for their awesome soup base. It is interesting to know that this wanton mee stall at Hong Lim serves really fantastic laksa yong tau foo with noodles ($4/$5). 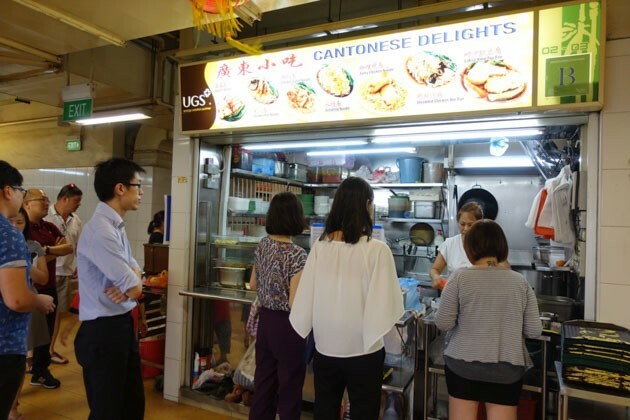 This is also another yong tau foo stall near the CBD that commands a long queue of office workers during lunchtime on weekdays. The laksa is made up of coconut-based gravy that is very smooth and silky on the tongue. It has an overall Singaporean flavour of its own, resembling that of the traditional Hakka yong tau foo, but a more modern twist to it. Another Yong Tau Foo stall at People’s Park Food Complex that is spotted to generate a human chain during the weekday lunchtime peak. 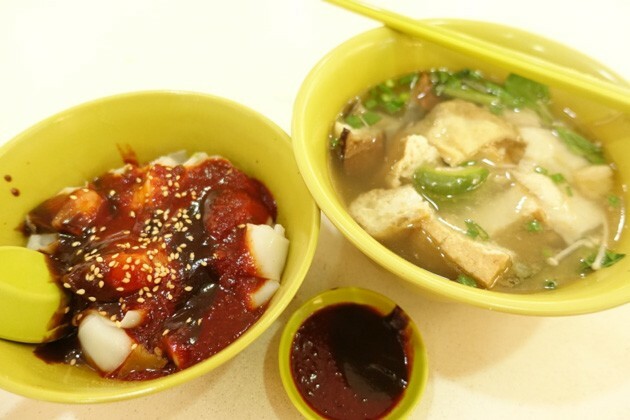 Yong Xiang Xing only serves one item with set ingredients i.e yong tau foo with soup ($3.50). The set consists of silky toufu, fishballs and taupok, with the absence of any noodles nor carbo fillings whatsoever. This is the perfect selection for a light, savoury treat or side dish in accompaniment with other good snacks when one frequents the People’s Park Food Complex. In fact, this is an ideal choice of meal for those who are on a diet – a dish that is low-fat, low carb and healthy. 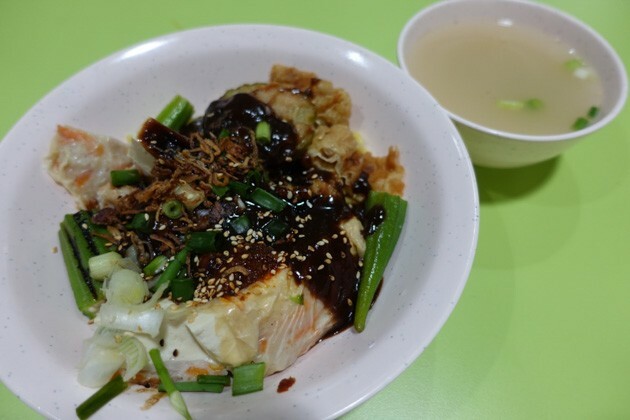 Apart from the traditional Hakka and Ampang style yong tau foo, Fu Lin offers an interesting rendition of the dish, causing its yong tau foo menu to deviate from the norm. Here at Fu Lin, customers have the choice of having their yong tau foo items fried crispy and topped with a generous layer of chicken mushroom gravy that makes a thick dressing for the dish. The 6pcs Yong Tau Foo, Fried + Gravy ($5.20) is a dish that is very fragrant. Apparently the chicken mushroom sauce gives the ingredients a slightly spicy braised “lor” taste. One that is likened to that of lor mee. I very much love the thick starchy texture of the gravy which makes it unique from other YTFs. However, if you wish to go for something healthy, this is definitely not the style of yong tau foo to go. But if you’re the one who finds the normal yong tau foo too boring, Fu Lin’s fried yong tau foo with chicken mushroom gravy guarantees you a yong tau foo that’s so much more. 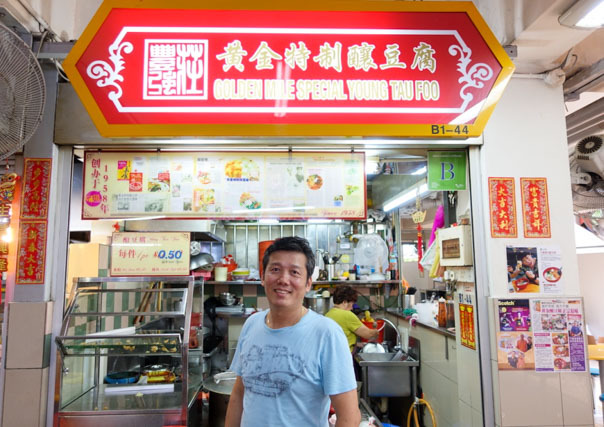 A family-owned business with a long history of establishment, Golden Mile Special Yong Tau Foo has been serving generations of senior customers and loyal patrons. 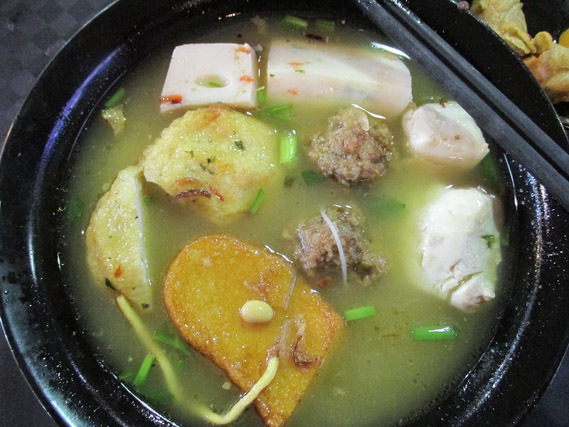 Nonetheless, this authentic recipe of Teochew fish-based yong tau foo has a unique delectable flavour that appeals to the younger generation as well. The yong tau foo ($0.50 per piece, min 8 pieces) has an array of in-house made ingredients for customers to make selections from. Mr Chng Fang Khiang, the second generation owner, explains that all of their ingredients are made from the same fish paste, using the in-house machine that grinds up yellowtail fish. 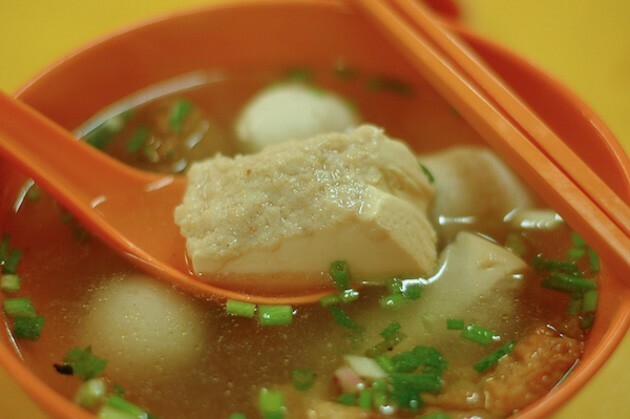 The result is freshly-flavoured fishballs which are not just springy upon bite, they also contain distinguishable layers of malleable, meaty texture. These handmade fishballs are heavenly palatable and are a rare gem to go with your bowl of Yong Tau Foo. 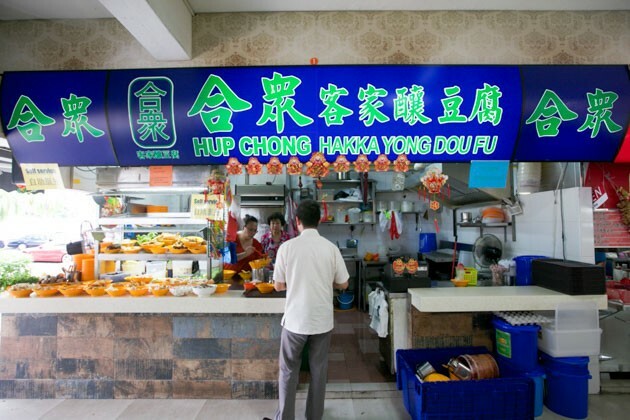 Starting out in 1982, Hup Chong Hakka Yong Dou Fu has more than thirty years history of establishment. It now has two branches situated at Lorong 1 and Lorong 8 Toa Payoh respectively. 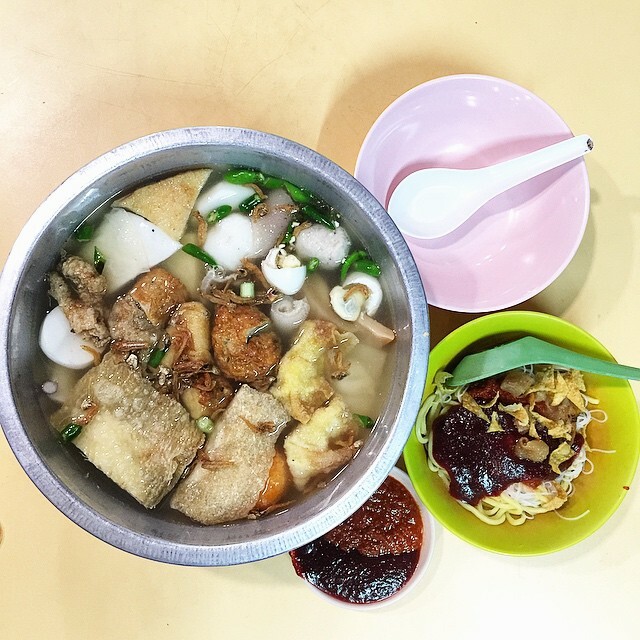 I tried the dry yong tau foo ($0.50 per piece, min 8 pieces) with kway teow. The highlight of the yong tau foo ingredients at this stall is that they are all very thick and rich in both flavour and content. I very much love the deep fried ngoh hiang, meatballs and tofus, indeed unique to this yong tau foo stall. 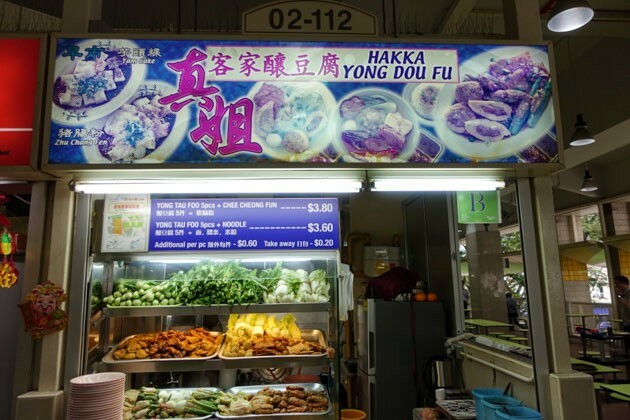 Soon Li Yong Tau Foo stall is known to be very elusive and only operates around midnight in Bukit Merah Food Centre when most of the other stalls have closed for the day. They stay open till around 3am and is gone again like the wind. Wait time typically takes 30 minutes or more due to the long queue, and the stallholders are grumpy as heck. Soon Li is recommended for sharing amongst supper friends (especially after a fun night out), and comes in a big metal bowl of delicious soup. Not entirely sure how they charge as it seems up to the auntie’s whim, but individual portions come up to about $5, while big metal bowls will come up to about $15. Ingredients tend to be more luxurious as well with stuff like sio bak and intestines, while the heartwarming soup is not to be missed.